Before I began blogging, I started to take pictures of anything I cooked and posted it on my Facebook. Out of all the food pictures I posted, the one that got the most comments was this photo. 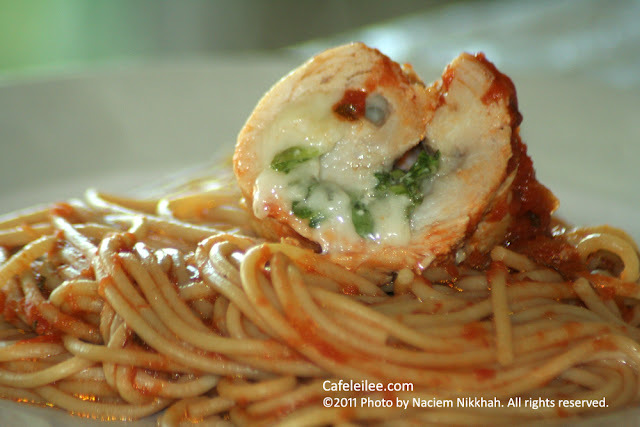 The melted mozzarella oozing out from the chicken rollatini makes for one of the most photogenic foods . So this week, when the picture for my delicious orange chocolate cake or breakfast smoothie didn't turn out well, I started looking in the archives, until I found this one. Place the chicken pieces on a clean work surface. Sprinkle with salt and pepper. place some chopped spinach leaves on the chicken, cover with sliced mozzarella. Roll up the chicken and seal with one or two toothpicks. In a large skillet over medium-high heat warm up the olive oil. Add the chicken. Brown the chicken on all sides, about 3 minute per side. Remove the chicken from the pan. Add the wine and simmer for 2 minutes while scraping up the brown bits from the bottom of the pan with a wooden spoon. Add the marinara to the reduced wine in the pan. Simmer for 5 minutes to let the flavors marry. Return the chicken to the pan. Simmer the chicken in the marinara sauce for 10 minutes. Turn the chicken over and simmer until cooked through, 5 to 7 minutes. In the meantime, cook the spaghetti according to the package direction. Before draining the pasta when it's cooked reserve about half a cup of pasta water. Remove the chicken from the pan. Add pasta and the reserved pasta water to the sauce and toss to make sure the pasta is coated with the sauce. Move to a serving platter. Cut the chicken in half. Remove the toothpicks and arrange around the pasta. سینه مرغ بدون پوست و استخوان ۴ قطعه، به صورت افقی نصف کنید، تا هر سینه به ۲ تکه سینه نازک تبدیل شود. بعد سینه هارا با یک ماهی تابه بکوبید تا نازک شوند. مرغ ها را روی یک صفحه تمیز بگذارید، نمک و فلفل بزنید. کمی از اسفناج ها را روی مرغ بگذارید و با چند ورقه از پنیر یا پنیر رنده شده بپوشانید. مرغ را لوله کنید و با یکی دو تا خلال دندان محکم کنید. توی یک ماهی تابه روی شعله متوسط تا زیاد روغن زیتون را گرم کنید. مرغ را در روغن کمی سرخ کنید. حدود ۳ دقیقه برای هر قسمت مرغ. مرغ ها را از تابه خارج کنید. شراب یا آب مرغ را اضافه کنید. و با یک قاشق چوبی خوب هم بزنید تا شراب برای ۲ دقیقه کمی بخار شود. سس مارینارا را اضافه کنید و بگذارید تا مخلوط برای ۵ دقیقه بجوشد. مرغ ها را به تابه اضافه کنید، و حدود ۱۵ تا ۱۷ دقیقه بگذارید مرغ در سس بپزد. در این مدت ماکارونی را طبق دستور روی بسته بپزید. قبل از اینکه ماکارونی را آبکش کنید حدود نصف پیمانه از آب ماکارونی را بردارید. مرغ را از تابه خارج کنید. ماکارونی با آب ماکارونی را به سس اضافه کنید و مخلوط کنید تا ماکارونی خوب با سس آغشته شود. سپس پاستا را تو ظرف مناسب بکشید. مرغ ها را نصف کنید و خلال دندانها را خارج کنید و اطراف پاستا بچینید. You are right this makes for a very photogenic dish!